(Nanowerk News) MIT chemists have created a new material that combines the flexibility of polymer gels with the rigid structure provided by metal-based clusters. The new gels could be well-suited for a range of possible functions, including drug release, gas storage, or water filtration, the researchers say. These new gels, known as polyMOCs, are a hybrid of two materials called metallogels and metal organic cages. Metallogels, which consist of metals bound to polymer chains, are similar to regular polymer gels in that they are soft and viscoelastic. Metal organic cages (MOCs), on the other hand, have a rigid structure and tend to form crystalline materials. “One can imagine a class of materials that borrows from both of those, and so has the well-defined, self-assembled structures of the MOCs, but also has the viscoelastic properties of a polymer gel. 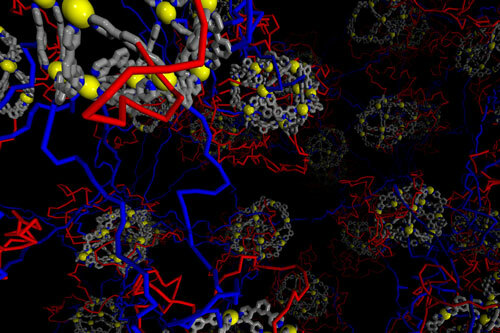 That’s what we’ve tried to make,” says Jeremiah Johnson, the Roger and Georges Firmenich Assistant Professor of Natural Product Chemistry and the senior author of a paper describing the gels in Nature Chemistry ("Highly branched and loop-rich gels via formation of metal–organic cages linked by polymers"). The paper’s lead author is Aleksandr Zhukhovitskiy, a graduate student in MIT’s Department of Chemistry. To create these gels, Johnson and colleagues built on a technique known as metallo-supramolecular assembly. This strategy allows chemists to generate three-dimensional shapes, such as spheres, paddlewheels, or pyramids, by mixing polymers that are attached to molecules called ligands. These ligands are organic compounds that can bind to a metal atom. In this case, the researchers used a ligand containing two pyridine groups that each can bind to the metal palladium. Each atom of palladium can form bonds with four other ligand molecules, creating a rigid, cage-like structure with 12 palladium centers and 24 ligands. These centers then connect with other metallic cages by flexible polymer linkers, forming a large, self-assembled gel. While each metal cage can have up to 24 polymer chains attached to it, only four or five of those connect to other metal cages. These extra, unattached chains loop back and attach to their own metal cage. These loops are commonly referred to as “defects,” but the MIT team saw them as an opportunity to enhance the material by replacing some of the ligands on those chains with new functional molecules. In this study, the researchers added a fluorescent molecule called pyrene in place of some of the looped ligands. “When we look at this material under a UV light it’s fluorescent, but mechanically it’s identical to a material without the pyrene ligand. The modulus is the same, the swelling behavior is the same, but now this gel is intensely fluorescent,” Johnson says. This technique is general enough that the researchers should be able to add many other types of molecules with different functions, Johnson says. Such gels could be used for drug delivery by designing them to store drug molecules within the metal cages. They could also be used for storing gases such as hydrogen, which would be useful in cars that run on fuel cells. By adding ligands that can grab and isolate heavy metals, these gels could also be adapted for water purification. The researchers are also experimenting with creating similar gels with different cage shapes, and developing materials that use metals other than palladium. These metals, including zinc, iron, and titanium, are cheaper and potentially less toxic than palladium.